=AE= Get Artix in Super Smash Bros! All Forums >> [Artix Entertainment Games] >> [AdventureQuest] >> AdventureQuest General Discussion >> AQ Design Notes >> =AE= Get Artix in Super Smash Bros! 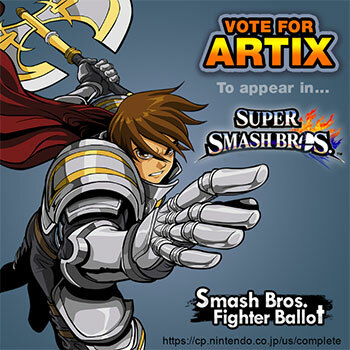 We have a chance to get Artix added into Super Smash Bros. for Nintendo 3DS/Wii U in a new contest, but we're going to need everyone's help to do it!